Each home has its own unique story and personality. Professional landscape lighting helps bring those to life. It is a perfect way to accentuate the landscape that you’re proud of, while highlighting architectural features, enriching your garden beds and providing a safe passage across walkways, patios and driveways. Your vision, when coupled with Castle Point Landscape Design’s years of experience, transforms our custom landscape lighting designs into memorable experiences. When you work with our outdoor lighting experts, you can expect high-quality products and services that help add a new dimension to your home and create the warm ambiance you’re dreaming of. Landscape lighting can do far more than simply illuminate a landscape or a structure. It can add or extend living space, provide safety and much more. Safety. Properly lit walkways and stairs help to limit liability, while ensuring safe passage after dark. Security. A well-lit landscape and yard offers a feeling of security. When you keep your outdoor areas illuminated, you can enjoy greater visibility and deter potential intruders. Usability. If you have a deck or patio with seating, add comfortable and attractive lighting to enable you to linger longer outside. Appearance. 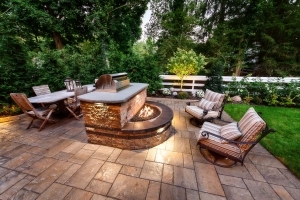 Of course, lighting up your outdoor space can enhance your home’s look. With proper positioning, your outdoor lights can make the architectural features of your home stand out, creating an enchanting façade after sundown and boosting curb appeal. You can also use these lights on commercial properties to create an inviting and colorful curb appeal. You’ve pulled out all the stops to make your house and yard look beautiful. So, why let that hard work disappear at nightfall? At Castle Point Landscape Design, our experts can help you find the best landscape lighting solution for your unique property–one that will put your property in the best light after the sun goes down. While there are many options when it comes to outdoor lighting, low-voltage systems are safer to work with and less costly to install. Plus, they enable you to save on energy costs. From uplighting and area lighting to shadowing and path lighting, our skilled landscape lighting team will work closely with you to choose from and install a variety of low-voltage, sustainable options. At Castle Point Landscape Design, we understand that each customer is unique and so is each property. That’s why the first step in our outdoor lighting design process is an on-site consultation with you to determine your needs, wants and concerns for your outdoor space. After the consultation, you can leave the details to us. Our experts and designers then develop a custom, low-voltage landscape lighting solution that perfectly complements your property and captures your vision. When you work with Castle Point Landscape Design, our team manages your outdoor lighting design and installation from start to finish. We work to ensure that no detail is overlooked and we transform the look and feel of your home, just as you wanted. We’re a talented team that will always go further, work harder, and do more.